We added 54-165 Watt PV panels to our house. Click here to see a near real time view of our panels in action. On March 27, 2004 our total power generated passed 10,000 Kilowatt/hours!!!!!!! On June 11, 2005 our total power generated passed 20,000 Kilowatt/hours!!!!!! On March 15, 2006 our total power generated passed 30,000 Kilowatt/hours!!!!! On February 14, 2007 our total power generated passed 40,000 Kilowatt/hours!!!!! On September 23, 2007 our total power generated passed 50,000 Kilowatt/hours!!!!! On July 10, 2008 our total power generated passed 60,000 Kilowatt/hours!!!! 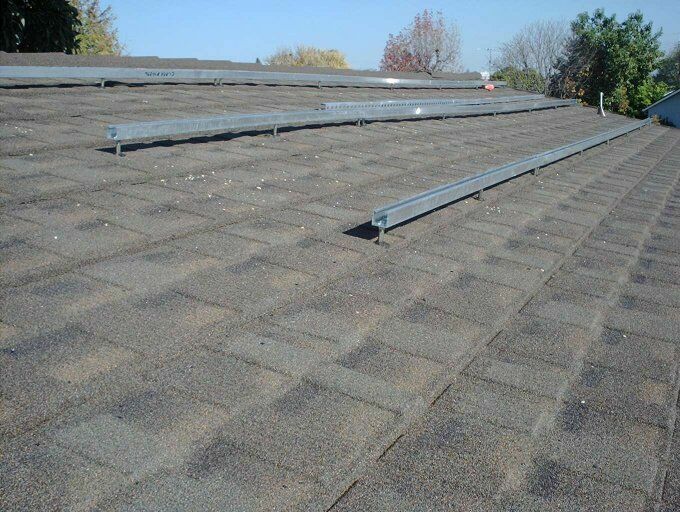 Our solar photovoltaic installation converts sunlight to 240 volt AC electricity. Any power generated in excess of what we use is delivered to the electric company (PG&E) for distribution to others. Our electric meter records the net power (consumed minus generated). If we generate more than we consume, the meter runs backwards and we receive a credit. 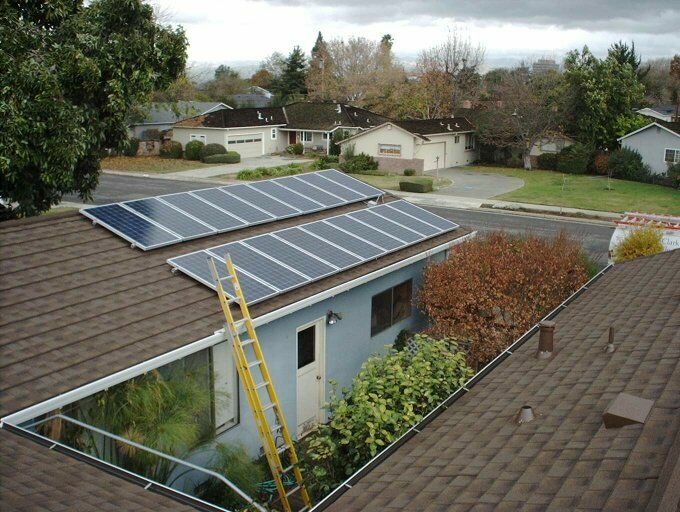 The process is called "Net Metering". We have a time of day use meter. We pay 8 cents a kilowatt/hour from 6 pm to 10 noon and 32 cents a KW/h from noon to 6 pm. If the sun is out, this will mean we will be selling power to PG&E at 32 cents a KW/h from noon to 6 pm (which is about peak for the system in the summer) and will be selling power at 8 cents a KW/h at other times. 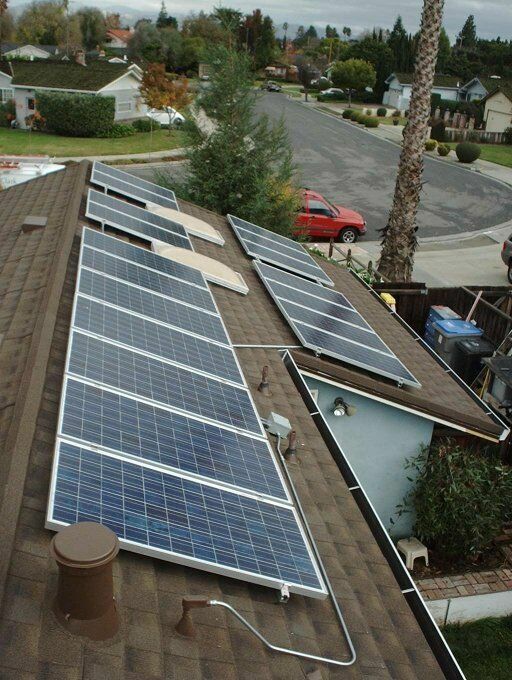 The installation consists of (36) 165 watt Sharp photovoltaic panels and two SMA Sunny Boy 2500 watt inverters. 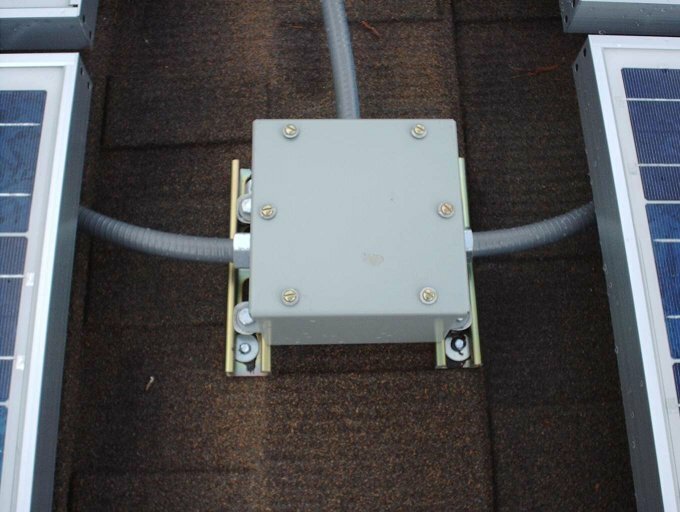 Due to loses and inefficiencies, the total installation is rated 5000 watts or 5 Kilowatts. I designed my own mounting system made from Unistrut aluminum channel and custom made aluminum brackets. By using aluminum for the mounting hardware, I was able to keep the weight of the installed system lower and avoid galvanic action due to dissimilar metals (the frames of the PV panels are aluminum). I chose to have the panels separated a little in between each panel and between each row. This was done mainly for cooling in the summer and ease of maintenance. It is very important to remember that all the components on the DC side of the system be rated for DC. Sometimes these items can be hard to find. 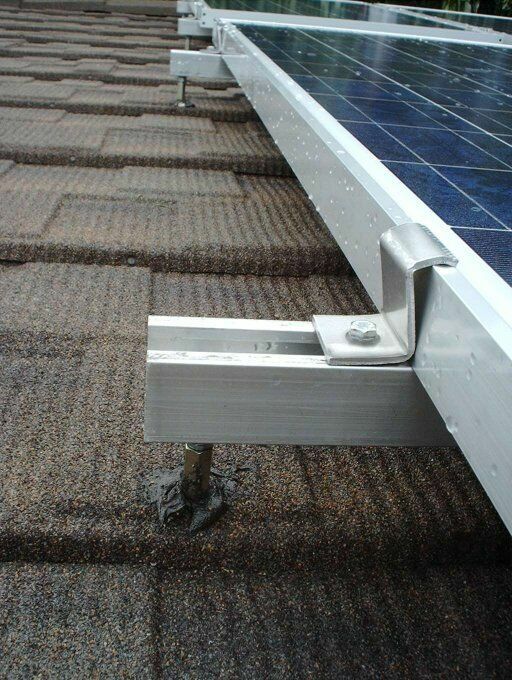 The Sharp PV panels come with USE-2 wire with integral MultiContact connectors. This is a UL listed wiring system. The panels just plug together. We did have to make sure that none of the wires were exposed, since the voltage in them can exceed 400 volts DC. We did this by making sure the wires were up underneath the panels. I had to add some raceway for the wires to get between sections of panels on bank 2 where they were separated by the skylights. The inspector initially had a problem with the wiring method until I showed him the UL listing of the panels and MultiContact connectors. He also was going to turn down the inverter hook up because he considered them a separately derived system. 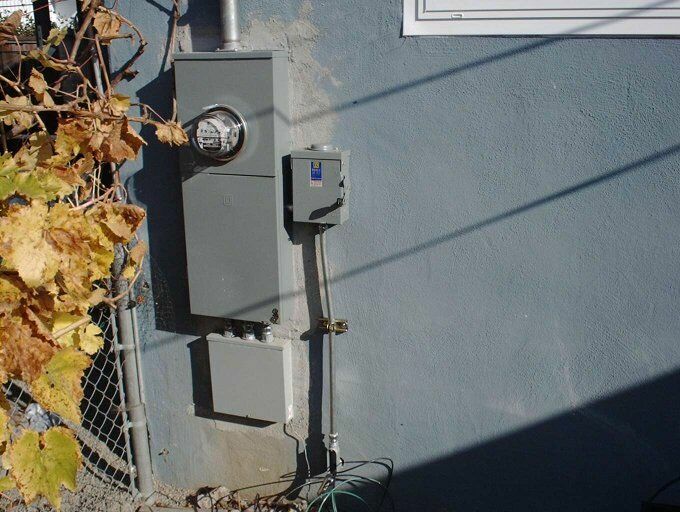 They are not since there is no neutral connection and the inverters need AC power to operate and they are directly connected to my main panel, they can not generate electricity if there is not PG&E voltage present. We called his boss and his boss agreed that I was correct. The inspector signed the permit and left with a little of his ego bruised. The system has no moving parts and no batteries. 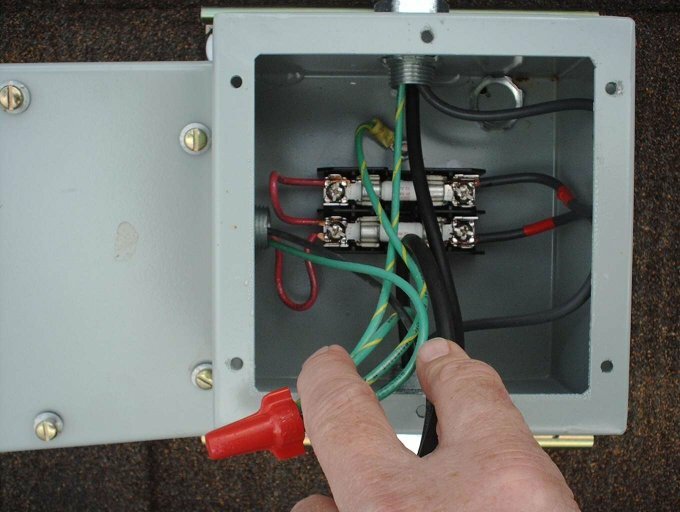 The only maintenance is a once a year check of the mounting brackets and the electrical connections. The estimated life of the system is more than 25 years. We hope that what we are doing will (1) pay for itself in a reasonable period of time (at the current rates we are guessing between 6 and 8 years), (2) be some small help to alleviate California's power problems and our country's dependence on oil, and (3) encourage others to do the same, (4) allow us to use our house as a showcase for selling PV installations through the company I work for, Clark Electric. My union, the IBEW Local 332, partnered with the NPCP (see the links below) to make a group purchased of the photovoltaic panels and inverters. This allowed us to get the items at wholesale prices. The goal of this partnership is to train our union’s members in the installation of PV systems. To this end I can say it is working. I learned a lot about PV systems and their installation though my own installation (enough to know at least more than the inspector). In June of 2013 we added another 2500 watts and leased an all electric Fiat 500e. There is a program available on the web for calculating system performance called PV Watts. I used this program to calculate how much my system should output. 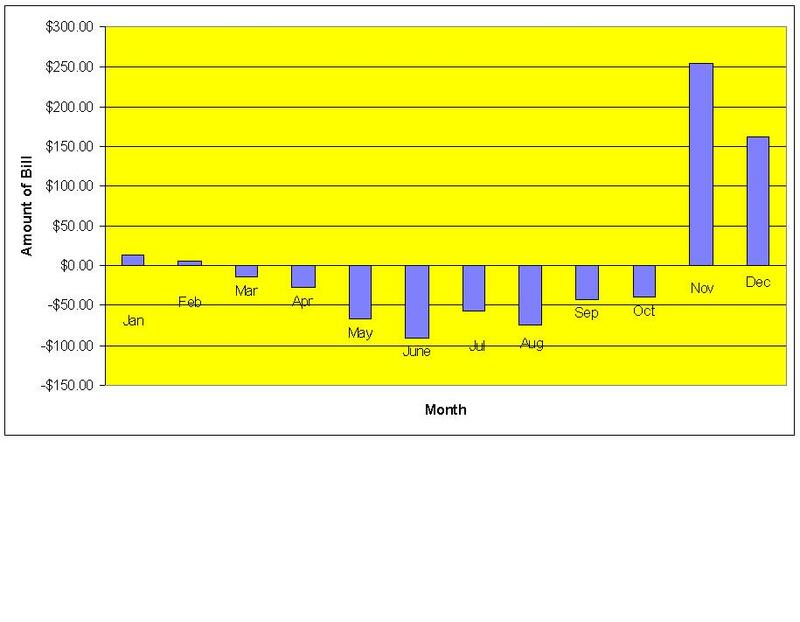 For the first 30 days of operation (December 12 to Jan 11), my system output 298 kilowatt hours of electricity. This is about 20 kilowatt hours less than I was expecting. Most of the 20 kilowatts hour loss came from shading on my system. I have observed that with 12% of the system shaded, the output drops by 50%. It is very important to keep shade from your system. My shade is coming from my neighbors trees. The worst tree is two houses away. I am hoping as summer comes and the sun is higher in the sky, this tree will no longer shade my system. There is still one palm tree that will shade my panels for about 2 hours a day. There is a law in California (the Warren-Alquist act section 25980) that say once you install a system, no one can build or plant anything that will shade your system. This law does not apply to existing conditions when your system is installed. The first 14 days of operation it rained or was overcast every day. I have had only three cloud free days in the first 28 days of operation. I had calculated that we should generate 20 kWh around the shortest day of the year and 40 kWh on the longest day. On March 18th, a few days before the equinox, we generated 30kWh. It looks like I am right on with my calculations. Interesting cloud effect: I noticed on days with cumulous clouds, when the sun would appear, the system out put jumped from 3800 watts to 5000 watts, a 31% increase. I called Sharp solar and asked about this. The cause of this they said was something they called the cloud effect. It only happens with cumulous clouds. When the sun appears next to a cumulous cloud, the cloud focuses the light from the sun increasing the suns intensity. The effect of dust on performance. We went 4 weeks without any rain. I noticed a film of dust had covered the panels. I hosed off the panels to wash away the dust. After cleaning off the dust, I had a 7% increase in output. Jan 16, 2003 Daily output exceeded 20 kWh for the first time (20.6). February 1, 2003 Power output exceeds 4000 watts for the first time (4100 watts). February 2, 2003 Fist day we generated more electricity than we used. February 23, 2003 Total output exceeds 1000 kWh. 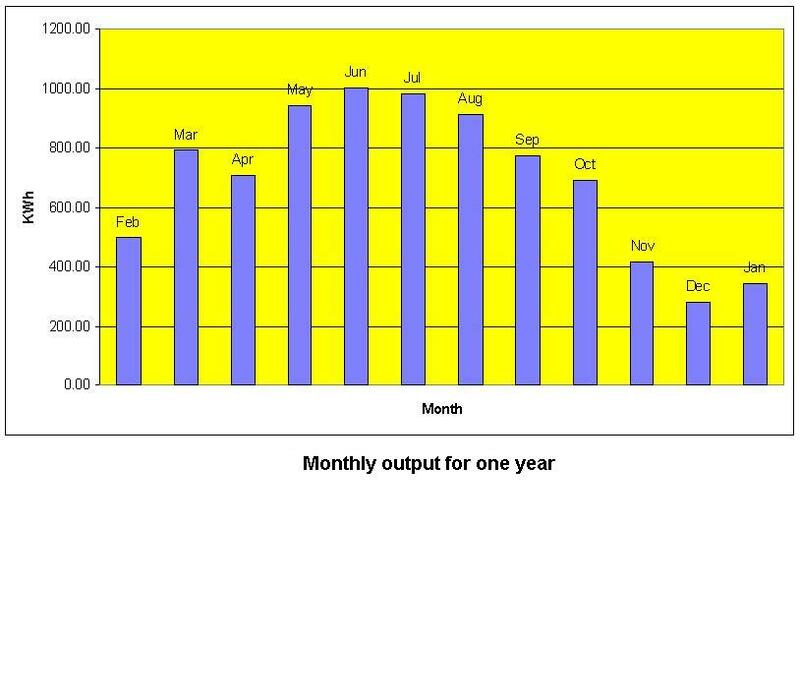 March 25, 2003 Total energy output exceeds our usage since system installation. 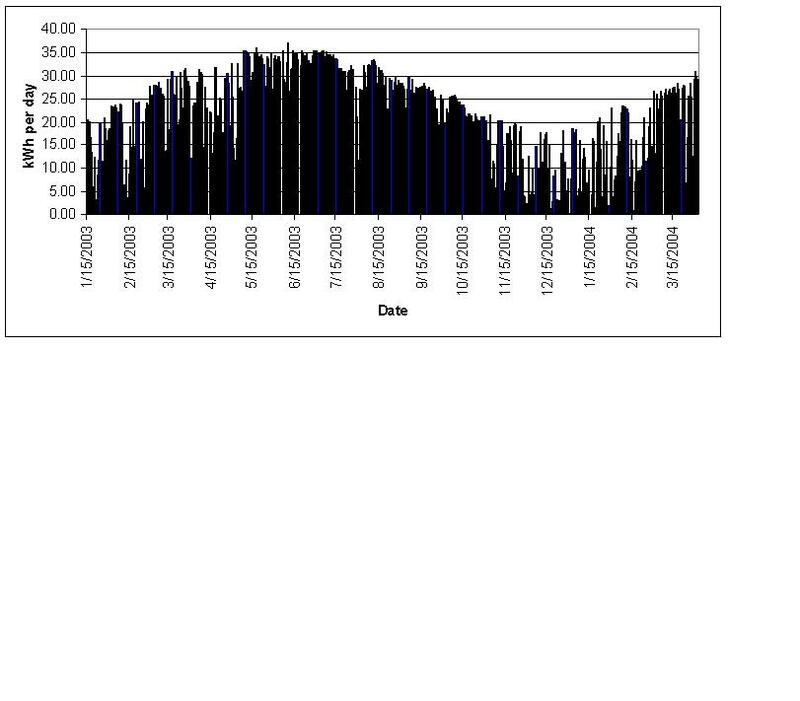 Total system output from 12/12/02 to 08/302008 - 62566 kWh. This is an equivalent to the energy (if used to generate electricity) in 5213 gallons of gasoline. Select each image by clicking on the picture. The end bracket and strut support for the end of a row of panels. 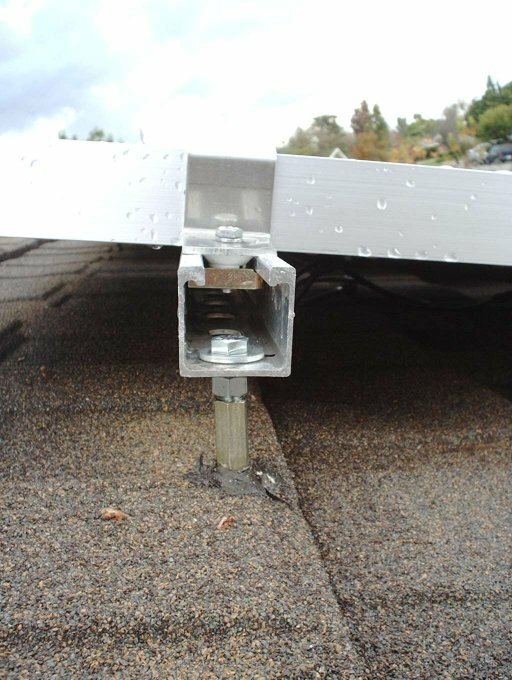 One can see the 1/4" bolt and cone nut with which the bracket is connected. This is another view of the end bracket. One can also see the support for the Unistrut. The custom bracket that is placed between two panels. There are two rows of (9) panels each that feed each inverter. These two rows are paralleled before the inverter. This requires each row to have it's own 10A DC rated fuse. A view inside the combiner box showing the fuse and fuse holder installation. Unistrut supports for bank 2. Unistrut supports for bank 1. View of bank 1. 18 PV panels..
View of bank 2. 18 panels. 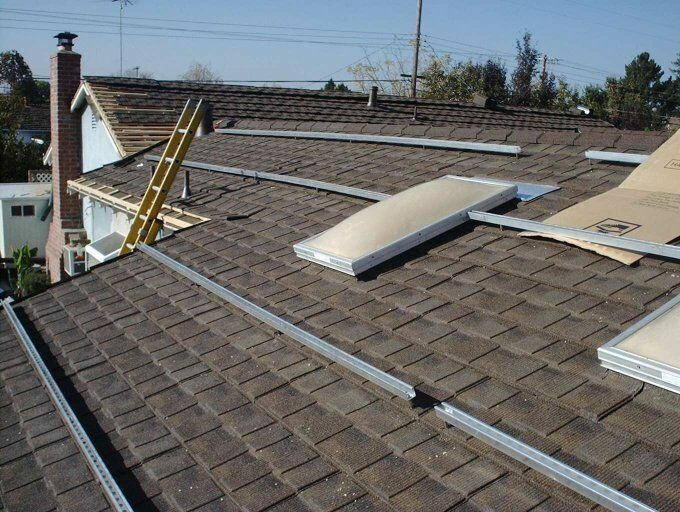 Notice the extra work to install the panels in between the skylights and the different widths of the roof. These are the two SMA Sunny Boy 2500U inverters. Also in the picture are the two 600V DC disconnects and the sub panel above the inverters that I used to combine both inverter outputs so they could be wired to a single disconnect required by PG&E. The disconnect required by PG&E. It must be within sight of and no more than 10' from the meter. I have a disagreement with PG$E about the necessity of this switch since the inverter can not generate electricity without PG&E voltage present. The requirement for this disconnect added about $1000 to the installation cost of the system. 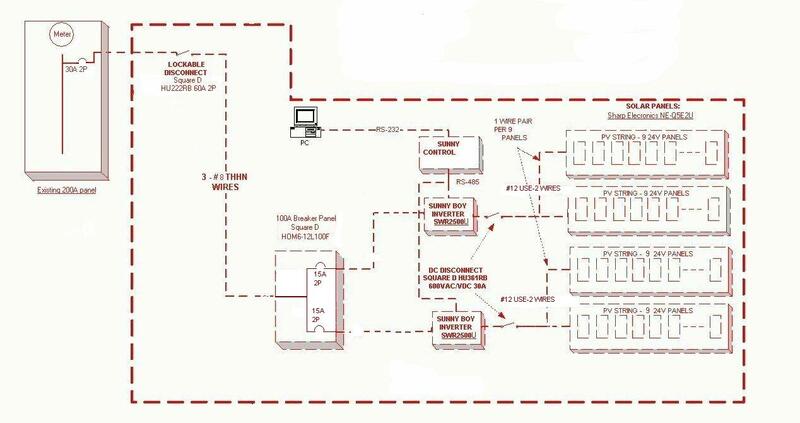 The schematic used for our system. This page was last updated.